dataMetrics Software is honored to receive the Best in Tech 2010 Award for RTI from Scholastic. and not on athletic ability? Our goal is to foster and spread great ideas that will impact K12 education in America. We aim to provide a platform where the smartest thinkers, greatest visionaries, and most fascinating teachers will be inspired and will have the opportunity to inspire others. Meeting these requirements can position any education technology implementation effort for success. Do YOU Police the Universe? I am new to this blogging idea. I am taking classes online to get my teacher's licensure. This is the first time I have heard of Classroom 2.0. Can anyone inform me of exactly what it is and how it is used in the classroom? Teaching and Learning are two sides of the same coin but they are different. A student learns using the web and a spreadsheet. A teacher gives an assignment that could be solved using the web and spreadsheet, and ideally using different tools. When we go to an online conference we are doing E-Learning and the presenters, E-Teaching. I am interested in starting nature journaling in my classroom next year and I'm looking for some start up tips. Welcome to the 2010-2011 school year! 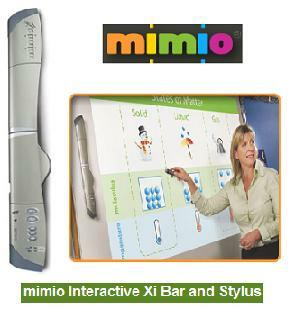 This week, I tried out an “Interactive Xi Bar” that the folks at Mimio loaned me. I really liked it. I am doing research for a graduate class about Marzano's Nine Essential Instructional Strategies; specifically Setting Objectives and Providing Feedback. Looking for any resources, personal thoughts, ideas, etc. Anything would be helpful! Thanks so much!